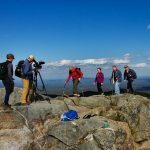 There is a grand project afoot among New England’s most accomplished hikers; it is one that transcends lists, the short-term, and affords years of exploration and challenge. Among those few hikers is my friend, Bill Robichaud. 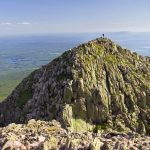 After repeatedly climbing the same mountains, he left the most trodden trails and set out to accomplish something remarkable: To “redline” New Hampshire’s White Mountains. The objective of redlining is to hike every bit of every trail on a particular map. The term is derived from using a red marker to indicate completed hikes. In Bill’s case, he has ambitiously chosen to redline the AMC’s White Mountain Guide, which features approximately 1,420 miles of trails. It’s a big deal. I recently caught up with Bill to chat about his project, what it means, and all it entails. Q: The idea to hike every mile of every mapped trail in the Whites—did it just come to you, or was it a nagging, sort of ongoing thought that you couldn’t suppress? Tell me about the moment when you committed to it. 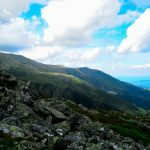 Bill: After finishing the 4000-footers in New Hampshire, I felt stagnant, and needed another hiking game to play. Sometime in early 2013, I read about redlining, and upon finding and filling out the spreadsheet, saw that I had quite a bit of it done (~30%). There and then, I set myself a goal to get to 50% by the end of the year. Q: Is yours a solo project, or do you invite friends to hike with you? Bill: It’s definitely not a solo project, though I have done a fair amount of it alone. See what you’ve done… now I’m going to have to go back and see what I’ve done solo, and what I haven’t… thanks Justin! I’ve met a bunch of amazing people that are working toward the same goal, and have even managed to turn one staunch opponent of it into a redlining fool. Q: You’re a big fan of EMS. What’s your favorite piece of gear for redlining? Bill: My EMS Hyperion Jacket. It’s been my go-to piece of cold weather gear since I bought it. The jacket strikes the right balance between insulation and wind protection. When I get too warm going up hill, I can vent it quickly, while being protected from any wind that happens to be rolling through. Q: Before this project, you spent your days on high peaks and rugged, steep trails. Now you’re all over the place. Has it at all changed your perspective of the White Mountains? Bill: It sure has! Before, I thought of the White Mountains in the context of the 4000-footers, and found that it became very limiting. Once I started looking at the bigger picture, I came to realize just how much more there was out there. There are SO many beautiful areas that I would have completely neglected if not for redlining. 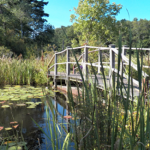 Robert Frost wrote of taking the path less traveled, and it having made all the difference. To say that getting off of the popular trails and into new areas has made a huge impact would be a grievous understatement. I feel like I get to know the mountains better every time I’m out, and it becomes less like leaving home to go there, and more like going home. Q: You’ve just finished a long day of hiking and the barkeep asks what you’ll have. Your answer? Bill: Beer! Hiking burns a lot of calories, and beer replaces some of them. It’s also one very tasty reason to come out of the woods after a four-day backpack. Wintertime calls for stouts and porters, summertime calls for ales and pilsners, all the time calls for Belgians. I generally gravitate toward local offerings and microbrews as a whole. Bill: The biggest challenge has been the short spur trails, ones that I may not have done when I was initially in an area. For instance, in June I hiked into the Pemigewasset Wilderness to pick up three sections of trail that were left hanging, the junctions of which I’d passed by numerous times. To hit the first new trail that day (the 0.2 mile Guyot Shelter Spur), I hiked 12 miles over the three peaks of the Bonds. The new trail mileage for that day was a whopping 2.9 miles, for 30 miles of hiking. Q: That one unexpected surprise—the thing that really put a smile on your face and made it all worth it so far—what was it? Bill: While there have been many unexpected surprises, but one really sticks out and reminds me to this day why I do what I do. In early January 2013 while working on my Winter 48, my friend Mike had organized a Meetup hike to Moosilauke. The rest of the group bailed, as there was rain forecast, but we stuck to the plan and redlined out Glencliff Trail. 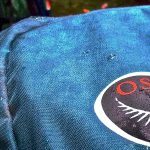 We did get rained on a bit, but it was never terrible. Reaching the socked in South Peak, we resigned ourselves to having no view from Moosilauke itself. But on our approach the sky brightened above us, and we popped out above the clouds, an undercast all around, the high peaks poking out like islands in the sea. This was my first experience with this phenomenon, and it was truly unforgettable. Q: EMS has stores all over New England. Which one is yours? Do they know what you’re up to? Bill: I usually frequent the store in Portland, though since I find myself in Conway so often, I’ll stop there too. When I come in to stock up for a backpacking trip, or pick up some random things, the employees will usually ask what I’m up to, as far as the trip I’m preparing for. They have no idea the true extent of my madness. Q: Surely you envision the final mile. Do you already have in mind the last trail you’ll hike to complete your redline? Bill: I have a few trails in mind, some easy with a good view at the end of it all, and others pure torment for all involved. Seriously though, I’d like to pick something that my parents will be able to join me on, it would mean a lot if they could be there for the finish. Q: How long will this take you? Bill: It’s taken a bit over four years to get this far, and I’ve only really been concentrating on it for the past two. I’m hoping to finish off the slightly less than 300 miles I have left in 2015, and am looking toward an Autumn finish. Q: There are a lot of web-based resources for hikers these days. What’s your favorite? Bill: Do I have to pick just one? I’ll give you a couple. 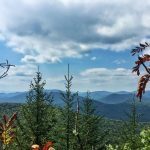 TrailsNH.com — Aggregator of all things Northeast hiking related, trail conditions, road closures, weather, stream gauges, you name it. More features are being added all the time! As of Sunday February 8, 2015, Bill has completed 81.5% of his redline, with only 266.6 miles left to go. He would have been a bit closer to his goal, but he slept late on Saturday. Although Bill is redlining the White Mountains, he sort of isn’t—he’s using a black marker to indicate completed trails on his map. Go Bill. If you’d like to continue the conversation with Bill, you can reach him through his blog. And show him some love by liking his Facebook page, On a Path With Heart.